Like every year-end, magazines are coming up with the lists of major things that happened in 2017. Among these, are the articles about the disappointing films of the year. One such article wrote, "Big Stars like Ranbir Kapoor and Katrina Kaif delivered a dud like Jagga Jasoos, a criminal waste of resources that should have never been allowed." I feel bad that Jagga Jasoos did not do well at the box office, but do not agree with this assessment. I think that it was one of the best movies of 2017. 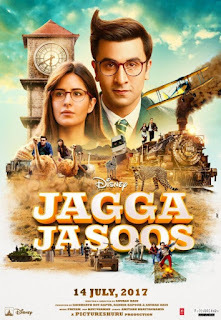 This post is about why I loved "Jagga Jasoos" and why I am going to watch it again many times in future. It has happened many times in the past that a good movie is not appreciated by people when it comes out. Some times, the film even gets good reviews from the critics but people stay away it. Yet, with time people come to recognise that the film was good and thus, sometimes the box-office failures turns into a cult films. "Jagga Jasoos" got mixed reviews, but people didn't like it. Some critics loved its magical ambiance, its music and its whimsical approach. But would it ever become a cult film? I hope so! BTW, the last time that I had really loved a movie, which had received bad reviews and had a worse box-office run, was "Jhoom barabar Jhoom". After years, it remains one of my favourites, but I have to say that it was never "rediscovered" and did not become a cult movie. 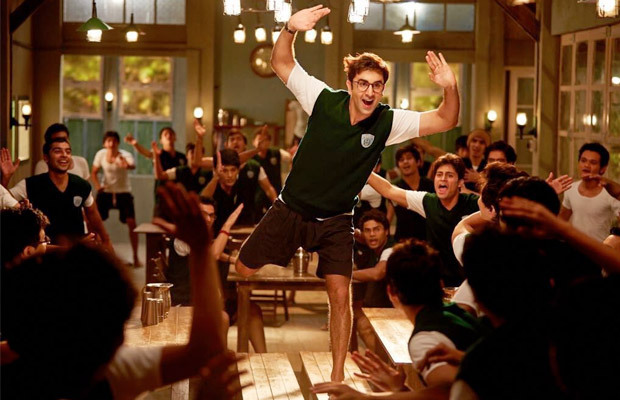 The film is about an orphan boy Jagga (Ranbir Kapoor), who is adopted by a man he calls Tuti Futti (Saswata Chatterjee) and then left in a Boarding school in Manipur. Jagga's only contact with his adopted father is an annual video-cassette with his birthday greetings. In the school, teenager Jagga is known for his observation and deduction skills and helps to solve murder mysteries - first the mystery of the clock-tower and then the mystery of the giant wheel. A mix-up of his birthday video-cassette with another cassette exposing an international arms smuggler called Bashir Alexander, alerts him to the danger to his adopted father's life. He asks the help of Shruti (Katrina Kaif), a journalist whom he had helped while solving the mystery number 2. Together, they go to Africa, manage to save his father and to expose the arms smuggler. In terms of Jagga's characterisation and ambiance, there is a clear inspiration from the Tintin comics. It could have been a regular action film but instead the director Anurag Basu has opted for an animation film kind of approach, with a teenage hero who is still studying in school. All the events in the film unfold in vivid colours, often with a painting-like effect, with an occasional present-past-back-to-the-present swing. The boy-hero has some serious stammer, so he hardly has any dialogues but has plenty of songs (great music by Pritam). The film has a rich canvass, full of small details, which you may miss in the first viewing. Apart from the saturated colours, especially in the shades of green, the film has some of the most unusual locations including a Kayan tribe village from Myanmar, an underground river flowing in a cave and the relatively unknown Manipur. It even has a bit of Assamese Bihu dance. It also has a rich presence of African animals including a a puma, some zebras & giraffes, some marmots and a wild escape riding on the ostriches. Visually, I found it difficult to take my eyes off the screen. As usual, Ranbir Kapoor is wonderful and he does manage to look like a slightly overgrown schoolboy. Even Katrina is ok (except may be in the song "Daru pi kar chale gaye", where she is bad). However it is the all the other supporting actors, from Saswat Chatterjee (father) and Rajatava Dutta (Police inspector) to Sayani Gupta (classmate and friend) and Saurabh Shukla (ex-policeman and conspirator) to the bit-part players like the nurses and doctors in the hospital, everyone is good. Sarvajeet Tiwari playing the young Jagga has the right mix of vulnerability and curiosity, and is perfect for the role. The film's opening scene with a pied-piper like figure leading a row of artists, shooting a film in Purulia, shown in a painting like effect, sums up the film - in spite of the Jasoos (spy) in its name, it is not a thriller, but a musical dipped in magic realism, to be enjoyed with a child's wide-eyed innocence. It did touch the child inside me and that is why I liked it so much. Though the film has Ranbir Kapoor and Katrina Kaif, there is no real romance between them. Their relationship is more like a school boy's crush on his favourite school teacher, which was inevitable since Jagga is shown studying in a school while Shruti is an affirmed journalist. Jagga's logic in involving Shruti in the search for his father - "She is so clumsy and unlucky but every time she has bad luck, it brings good luck to me" - is at best, contorted logic. The film is full of such contorted and yet exquisite moments and ideas. The film should have been shorter by about 40-50 minutes. The film moves from one episode to another in quick bursts, without really any time to feel the thrills. For example the lovely scene of the Kayan village, followed by an encounter with arms smugglers, is resolved in a one minute long escape down an amazing waterfall gushing out from a hill. Or the scene of the car chase with the shooter who keeps on missing the targets, ends before you understand what is happening. So many scenes are brief and terminate abruptly. A little longer build-up and follow-through of scenes, would have been better. So how could they reduce the film's duration? The film is so beautiful visually, that I think that if I was in Basu's place, even I would have had difficulties in deciding which scenes to cut from the movie. Still a slightly lesser number of events with longer and more emotion-filled conclusions would have helped in creating a better connect with audience. I think that Jagga Jasoos will be among my favourite films - films that I rewatch every now and then. If you didn't watch this movie when it was released, if you have the capacity to feel a child's wonder, and if you like reading comics, then my advice is - do get hold of its DVD and watch it! Better still, watch it with kids. Note: The images used in this post are from the publicity material of the film. I am not a big film lover but I will surely watch it.